St Kilda and Carlton will play in Wellington in the opening game on Anzac Day next year, which marks the 100th anniversary of the landing at Gallipoli. The match will start at 1.10pm local time (11.10am AEST), meaning it will coincide with the Anzac Day marches that take place in each capital city around Australia. It will be the first of five matches to be played on Anzac Day next year, which falls on a Saturday, and comes with the agreement of the Victorian RSL after discussions with the AFL. As our two countries look ahead and unite for such an important day, we acknowledge the historical significance of the Australian and New Zealand relationship,” Saints CEO Matt Finnis said. “This game gives our supporters a time to remember in a place they will never forget. State President of the Victorian RSL, Major General David McLachlan AO, gave his organisation’s blessing on the proviso that the New Zealand match would be televised only on Fox Footy. “Importantly the scheduling means that broadcasts of the matches on Anzac Day will not conflict with any live free to air televising of the capital city marches and other commemorative activities in the various states and territories,” he said. The full schedule for the historic day will be announced with the rest of the 2015 AFL fixture next Thursday. The clash with the Blues will be the third home and away game hosted by the Saints in Wellington and their first against a fellow Victorian club. It will also be the first Wellington game to be played during the day, which the Saints and the AFL hope will lead to a larger crowd at Westpac Stadium. The inaugural clash in 2013 between the Saints and the Sydney Swans drew 22,546 and the match earlier this year with the Brisbane Lions attracted 13,409 fans. There is no doubt that the slippery conditions over the past two years because the game has been played at night has diminished the quality of play. 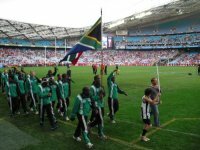 Meanwhile the late timeslot coupled with the length of the game, in comparison to a rugby match, has also severely impacted on the number of children and families who have attended. Given that the mighty Carlton Blues who are a traditional powerhouse and have huge support are the ones to make the trip this year it would not surprise if it was close to a full house for the first time. “The first-ever matches for premiership points in New Zealand, away from Australian soil over the last two years, have built a strong following across the Tasman and we look forward to an excellent contest between two foundation clubs of the competition,” said Simon Lethlean, the AFL’s general manager of broadcasting, fixturing and major events. The Wellington match will be Mick Malthouse’s 714th match as an AFL coach, equalling the League record held by Jock McHale.